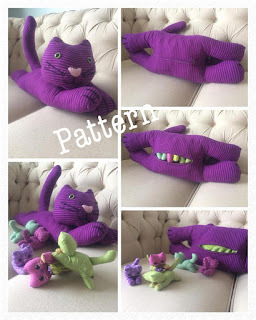 Meet Grapefruit, the youngest daughter of "Gidget the Cat", which I made my daughter last year for Christmas from my very own (and very first) official sewing pattern, Kitten Surprise. The pattern is basically a large mother cat that can hold up to 5 or 6 kittens in her zippered tummy pouch (depending on how strategic you are with your placement). Our entire Christmas last year was a "Homemade Christmas", which meant we each made gifts for every member of the family, and they all had to be hand made. It was the BEST CHRISTMAS EVER...but I'm still recovering, lol, so it will perhaps be a tradition that we continue every 5 years or so...once our energy levels are back to normal. As I was designing and making my daughter's Kitten Surprise gift, my oldest son decided he wanted to make her some little beds that each kitten could sleep in. At the time, I didn't take the time to take pictures as he went...but when I was typing up and putting the finishing touches on my pattern before I released it last month, I ended up making another kitten, whom Polly lovingly named Grapefruit, and so, of course, Grapefruit needed a bed! Polly, who is almost 8, decided it was a task she was up to doing herself, so I stood back and coached, and was able to snap a few pictures while she made this little bed. Hope you enjoy the tutorial, and please excuse any jagged edges or swerving sewing lines. I am so impressed with her little soon-to-be 8 year old skills! This little bed will fit any animal or doll that is approximately 5" long x 3 1/2" wide. Step 1: Once all your pattern pieces are cut out, you'll want to layer the mattress pieces as shown above, placing one mattress piece on the bottom, then place and centre an interior mattress piece on top of it, followed by a pillow piece (placed about 3/4" from the very top edge). Repeat this step for the other side of the mattress. Press all pieces (glue side down) so that all three layers fuse together. Step 2: Press the top edge of each mattress piece down about 1/4". Set mattress pieces aside for a moment. Step 3: With wrong sides together, sew along the top edge, and about 1 1/2" down ONE side edge of the blanket. Turn the pieces right side out and press. Step 4: If you are going to monogram a name onto the pillow, now is the time to do it. Choose which side of the mattress you want to face out, and stitch the name in the centre of the pillow (I always like to practice on a scrap piece of fabric first, to see exactly where the name should be placed). Next sandwich your blanket pieces between your mattress pieces (mattress pieces should be wrong sides together) as shown above, with the blanket folded down a bit along the sewn edge. Make sure all un-sewn edges of the blanket are lined up with the un-sewn edges of the mattress pieces. Step 5: Pin all the blanket and mattress layers together. Sew along both side edges, as well as the bottom edge, but leave the top edge open (the one you pressed earlier) so you can flip it all right side out again. Step 6: Flip the bed right side out, making sure each corner is pushed out nicely. Finish off the bed by sewing around the pillow area with a decorative stitch (this will make the pillow stand out, as well as close up that opening at the top. Now repeat and Enjoy the slumber parties that follow! 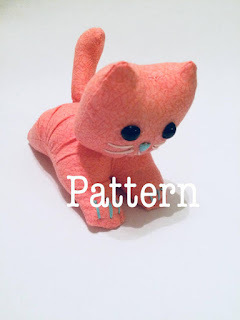 New Pattern ~ Kitten SURPRISE!!! I just released my Kitten Surprise Sewing Pattern over the weekend! This Pattern was so much fun to make!!! My daughter is an animal lover and I gave her a vintage Puppy Surprise for Christmas a few years ago (remember those??? ), just like I had when I was a kid. She LOVED it and immediately asked if she could have a Kitty Surprise as well...so...I decided to make her one this past Christmas (you get a little spoiled when you're unfortunate enough to be the only girl, and the middle child, sandwiched between 4 boys, lol)! Life has been crazy since then with lots of interesting health issues that have come my way, but I finally got around to writing up and releasing the pattern so that I could share it with all of you! Yay!!! Just in time for Christmas! You can buy it here, where I will e-mail it out to you within 24 hours of purchase, to the address linked to your Paypal account, or you can purchase it from one of the links below! As always, I am ALWAYS happy to help with any questions you may encounter along the way, so shoot me an e-mail anytime and I will get back to you! This listing is for a SEWING PATTERN only, not the finished item. There is no shipping charge on this item as it is a PDF file. The Pattern will be e-mailed to you within 24 hours of purchase, to the e-mail address linked to your PayPal account. My daughter the animal lover got a vintage Puppy Surprise for Christmas a few years ago, just like I had when I was a little girl. Ever since, she has been asking for a Kitty Surprise. I couldn't find one at the time, so I made one, and it's been a labour of love! This is a sewing pattern for a "Kitten Surprise". Unzip the mother cat's tummy, and you'll find baby kittens inside! The perfect gift for the animal lover in your life, and every child's dream! The finished mother cat measures 20.5" (52cm) long by 13" (33cm) high, and up to 5 baby kittens fit inside her pouch. Instructions are given for both pouncing baby kittens and laying baby kittens, so you can make some of each! Pattern comes complete with detailed pictures and written tutorial throughout (13 pages total). Hope you enjoy all the love and detail that was poured into this pattern! Please respect copyright laws. You cannot resell my patterns or any finished products you knit from them as they are copyrighted by me. I've really been struggling lately trying to define who I am without my knitting. I know that might sound silly, but for the last several years, my knitting patterns and my passion for felting, designing and teaching has brought me so much joy and purpose. Don't get me wrong, I am and always will be a wife and a mother first, and I love that, but my ability to create is really at the core of who I am, and I implement it in every area of my life, including with my family. Knitting especially has always been my favorite creative outlet. I developed tendinitis a few years ago in both of my arms, and at first it just meant that I had to take intermittent breaks from knitting or crochet, but it has now developed into something quite crippling for me. Carrying a baby, chopping vegetables, opening a jar of Peanut Butter, and lots of other simple tasks have become really hard and painful for me. I tried to knit a little doll sweater the other day fooling myself into thinking I could do it, only to discover that after only a few tiny rows I was in so much pain that I literally had to just sit there and hold my burning arms and try not to cry. I have other hobbies and interests, but this is something I've been doing non-stop since I was eight years old and it is a big part of me. Nothing else quite seems to fill that void. Maybe you can't relate, maybe you can, but that's what I'm going through. My brother in law gave me these three super sweet planks of wood a while back that he had sitting around in his shop. I've had a few ideas brewing up in my mind for a while, but was having a hard time pulling the trigger and starting this project because I didn't want to ruin such beautiful wood! I love love LOVE that there's bark still on these, and my front room has a few bare walls that need filling. My theme in said front room is "Aztec chic"...with a little bit of rustic charm. Not a real theme you say?!? Well, then I'm a pioneer I guess, but I like it ;) Anywho, I finally worked up the courage to go down to the hardware store and buy some stain today (English Chestnut by Minwax). I took a deep breath and stained the wood! SOOO glad I did. I like it even better than before (which I guess is the point, so good job me). Anyways, I sketched out a feather last night that I'm going to hand paint on as soon as the stain is dry, and then voila, we'll hang er' up! Yay!!! This listing is for a KNITTING PATTERN only, not the finished item. This headband pattern has been over 3 years in the making, for some reason my longest pattern to ever write! It is a very fun knit, and has a super unique increase section, which is what took me so long to write, because I wanted it worded well so that it could be perfect and clear for all my wonderful knitters! I am so excited that it is finally all written up! I want it to be very clear and easy to knit for the beginner, even though there are some more intermediate techniques in the pattern, so it is chuck full of pictures and diagrams to help you along your way. It’s a super stylish, comfy headband, knit using a very cool new stitch pattern (a variation of double knitting, but using only one strand of yarn) that I came up with so that it’s double thick for warmth as well as comfort. The pattern includes 7 sizes, and accommodates from 6 months - adult! Please respect copyright laws. You cannot resell my patterns or any finished products you make from them as they are copyrighted by me. Coming Soon ~ Polly Headband Knitting Pattern! I'm excited to let you know that after more than 3 years of working on my Polly Headband, it is finally ready for testing! Find more info by following the links to my website! Yay for this headband!!! I'm so excited! Please Note: This listing is for a CROCHET PATTERN only, not the finished item. Fergus is a true Irishman (complete with hat), as well as a natural pessimist, but underneath his rough exterior, Fergus has a big heart. He is always up for a big hug and a cuddle, which is perfect, because he always looks like he needs one! Fergus is 14” tall from head to toe, or 7” tall when sitting, and his hat is 3” tall. 100 PATTERN SALES!!! LET'S CELEBRATE! Halloween Craft - Milk Jug Skeleton!